Cuc Phuong Forest, 62 miles southwest of Hanoi, is a 61,000-acre preserve of one of the world's few remaining primeval tropical forests. Three quarters of Cuc Phuong is spread over limestone mountains, which abound in relaxing hot springs and fascinating caves and grottos. Flying lizards and yellow monkeys can be spotted here. Cat Ba Island, the largest island of the Cat Ba Archipelago, offers some of the most beautiful terrain and diverse ecosystems in Vietnam, including primeval forest, coastal mangroves, waterfalls, limestone lakes, freshwater swamps, and hot springs. The island's abundant fauna includes boar, wild cat, porcupine, deer, and monkey. Snorkeling, diving, and deep sea fishing are available at most beach resorts. The Pong Nha River caves offer excellent spelunking. Cycling is ubiquitous, as are backpackers. Hiking and horseback riding are ideal in the serene countryside. Vietnam's capital and second largest city retains its French colonial ambiance and is dotted with lakes and lovely parks. West of Hanoi are the Son La mountains, known for their sanctuaries, grottos, and pagodas. The traditional cultures of Vietnam's ethnic minorities still survive in the northern province's mountains, but these regions might be inaccessible because of border disputes between Vietnam and China. If a visit to the northern mountains isn't possible, travellers should be sure to visit the montagnard regions of Central Vietnam. Also in the north is Halong Bay, which the Vietnamese consider a wonder of the world. This tranquil, magical bay is dotted with more than a thousand limestone islands, which rise from the water in dramatic rock formations and harbour extensive grottos and caves. The most notable of the caves of Halong is Dau Go, an extensive cavern filled with stalactites and stalagmites that resemble a menagerie of birds and beasts. Central Vietnam also offers one of the country's most picturesque and uncrowded beaches at Nha Trang. Nearby Hon Yen island is home to the famous sea swallow nests, which are esteemed as culinary delicacies. The idyllic Central Vietnam coastline is also the locale of the Mui Le dunes, de rigeur for photographers. Westernized, bustling, cosmopolitan Ho Chi Minh City, formerly Saigon, is Vietnam's largest city. Inside this dense, teeming metropolis are countless links to the past, including a number of notable shrines and temples. Gia Lam, Ngoc Hoa, and Giac Ven pagodas are the best-known. Modern sites include Reunification Hall and Cholon Market. For a different perspective on the city, visitors can take a boat cruise on the Saigon River. East of Ho Chi Minh City is the Con Doa Archipelago, with fourteen islands of primeval forest, pristine beaches, coconut groves, coral reefs, and crystal clear waters. 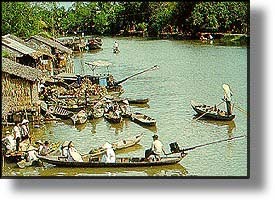 The Mekong Delta, which stretches from Cambodia to the South China Sea, is a vast network of canals and rivers amid a seemingly endless patchwork of rice paddies. Copyright (c) 1997-2005 interKnowledge Corp. All rights reserved.